365 Star Wars started out at the beginning of 2018 as 365 Star Wars Women. In this project I highlighted a new female character, actress, writer, producer, or artist from Star Wars films, TV shows, books, comics, and more every day. At the end of the year I had (as promised) 365 posts including 42 new interviews. You can click here to see highlights of all 365 posts. I also wrote about what I learned while doing the 365 Project on Medium – you can read that here. For 2019 I wanted to both continue to update the 365 Star Wars Women project as well as write about all aspects of the Star Wars Universe. This new site – 365 Star Wars – will include articles about 365 Star Wars Women, analysis articles, reference posts about Star Wars characters, droids, planets, and creatures, and issues of the Dantooine Digest. The Dantooine Digest will highlight a variety of Star Wars content that caught my eye in the last week or month as well as some fun odds and ends. Think of it as more of a “What I saw and loved this week” than a collection of Star Wars news articles. Other sites cover news so well already. If you’re looking to for a monthly overview of my writing on this site as well as the official Star Wars site (plus other projects) please subscribe to the 365 monthly newsletter. You can also follow 365 Star Wars on Twitter (@365_StarWars), on Instagram (@365StarWars), or my personal Twitter account (@amyrichau). 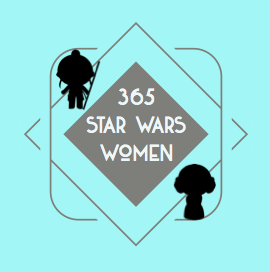 Thanks for reading and keep the recommendations for women to profile in 365 Star Wars Women coming! You can reach me at 365starwarswomen (at) gmail (dot) com. Note: This is a fan-made site not affiliated with Lucasfilm or any other entity. I do not claim to have copyright over the screenshot or promotional images included in this site and am using them under the Fair Use rule of U.S. Copyright law. If you have a concern about any images on this site or think I have missed a link or credit anywhere, please let me know at the email address above. To support this project please check out my Ko-Fi page. All of the donations I receive will help pay for the hosting fees associated with this site, help me pay for research materials, and perhaps a babysitter now and then to keep it all going.